Picture - Commemorative plaque; claim on the plaque is controversial regarding invention of the aileron. 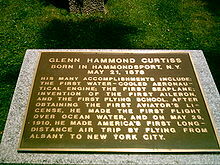 Glenn Hammond Curtiss (May 21, 1878 - July 23, 1930) was an American aviation pioneer and a founder of the U.S. aircraft industry. He began his career as a bicycle then motorcycle builder and racer, later also manufacturing engines for airships as early as 1906. In 1908 Curtiss joined the Aerial Experiment Association (AEA), a pioneering research group founded by Alexander Graham Bell at Beinn Bhreagh, Nova Scotia to build flying machines. Curtiss rose to fame by making the first officially witnessed flight in North America, winning a race at the world's first international air meet in France, and making the first long-distance flight in the U.S. His contributions in designing and building aircraft led to the formation of the Curtiss Aeroplane and Motor Company, now part of Curtiss-Wright Corporation. His company built aircraft for the U.S. Army and Navy, and during the years leading up to World War I, his experiments with seaplanes led to advances in naval aviation. Curtiss civil and military aircraft were predominant in the inter-war and World War II eras. Curtiss was born in 1878 in Hammondsport, New York to Frank Richmond Curtiss and Lua Andrews. Although he only received a formal education up to Grade 8, his early interest in mechanics and inventions was evident at his first job at the Eastman Dry Plate and Film Company (later Eastman Kodak Company) in Rochester, New York. He invented a stencil machine adopted at the plant and later built a rudimentary camera to study photography. On March 7, 1898, Curtiss married Lena Pearl Neff, daughter of Guy L. Neff, in Hammondsport, NY. Curtiss began his career as a Western Union bicycle messenger, a bicycle racer, and bicycle shop owner. In 1901 he developed an interest in motorcycles when internal combustion engines became more available. In 1902 Curtiss began manufacturing motorcycles with his own single cylinder engines. His first motorcycle's carburetor was adapted from a tomato soup can containing a gauze screen to pull the gasoline up via capillary action. In 1903 he set a motorcycle land speed record at 64 miles per hour (103 km/h) for one mile (1.6 km). When E.H. Corson of the Indian Motorcycle Company visited Hammondsport in July 1904, he was amazed that the entire Curtiss motorcycle enterprise was sited in the back room of the modest "shop". Corson's motorcycles had just been trounced the week before by "Hell Rider" Curtiss in an endurance race from New York to Cambridge, Maryland. In 1907, Curtiss set an unofficial world record of 136.36 miles per hour (219.45 km/h), on a 40 horsepower (30 kW) 4000 cc V8 powered motorcycle of his own design and construction. The air-cooled F-head engine was intended for use in aircraft. He would remain "the fastest man in the world," to use the title the newspapers gave him, until 1911, and his motorcycle record was not broken until 1930. This motorcycle is now in the Smithsonian Institution. Curtiss' success at racing had solidified his reputation as a leading maker of high-performance motorcycles and engines. In 1904, Curtiss became a supplier of engines for California "aeronaut", Tom Baldwin. In that same year, Baldwin's California Arrow, powered by a Curtiss 9 HP V-twin motorcycle engine, became the first successful dirigible in America. In 1907, Curtiss was approached by Alexander Graham Bell to provide a suitable engine for heavier-than-air flight experimentation. 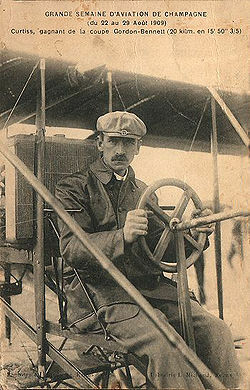 Bell regarded Curtiss as "the greatest motor expert in the country" and invited Curtiss to join his Aerial Experiment Association (AEA). Over the next two years the AEA produced four aircraft, each one an improvement over the last. Curtiss primarily designed the AEA's third aircraft, Aerodrome #3, the famous June Bug and became its test pilot, undertaking most of the proving flights. On July 4, 1908, he flew 5,080 feet, to win the Scientific American Trophy and its $2,500 purse. This was considered to be the first pre-announced public flight of a heavier-than-air flying machine in America. Curtiss received U.S. 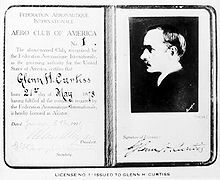 Pilot's license #1 from the Aero Club of America, because the first batch of licenses were issued in alphabetical order...Orville Wright received license #5. The flight of the June Bug propelled Glenn Curtiss and aviation firmly into public awareness. At the culmination of the Aerial Experiment Association's experiments, Curtiss offered to purchase the rights to Aerodrome #3, essentially using it as the basis of his "Curtiss No.1", the first of his production series of pusher aircraft. In August 1909, Curtiss competed in the world's first air meet, the Grande Semaine d'Aviation flying contest at Rheims, France, organized by the A�ro-Club de France. The Wrights, who were selling their machines to customers in Germany at the time, decided not to compete in person. There were two Wright aircraft at the meet but they did not win any events. Curtiss went on to win the overall speed event, flying a 10 km course at 46.5 miles per hour (74.8 km/h) in just under 16 minutes, six seconds faster than runner-up Louis Bleriot and winning the Gordon Bennett Cup. For this he was awarded French pilot's license No. 2 (Bleriot, who flew the English Channel in 1909, had been awarded license No. 1). This was a busy period for Glenn Curtiss in general. In May 1910, he flew from Albany to New York City to make the first long-distance flight between two major cities in the U.S. For this 137-mile flight, he won a $10,000 prize offered by publisher Joseph Pulitzer and was awarded permanent possession of the Scientific America Trophy. A month later he provided a simulated bombing demonstration to Naval officers at Hammondsport. Two months later, Lt. Jacob E. Fickel demonstrated the feasibility of shooting at targets on the ground from an aircraft with Curtiss serving as pilot. One month later, in September, he trained the first woman pilot, Blanche Stuart Scott. The fictional character Tom Swift who first appeared in 1910 in Tom Swift and His Motor Cycle and Tom Swift and His Airship has been said to have been based on Glenn Curtiss. The Tom Swift books are set in a small town on a lake in upstate New York. On November 14, 1910, Curtiss demonstration pilot Eugene Ely took off from a temporary platform mounted on the forward deck of the cruiser USS Birmingham. His successful takeoff and ensuing flight to shore marked the beginning of a relationship between Curtiss and the Navy that remained significant for decades. At the end of 1910, Curtiss established a winter encampment at San Diego to teach flying to Army and Naval personnel. It was here that he trained Lt. Theodore Ellyson, who was to become U.S. Naval Aviator #1. The original site of this winter encampment is now part of Naval Air Station North Island and is referred to by the Navy as "The Birthplace of Naval Aviation". Through the course of that winter, Curtiss was able to develop a float (pontoon) design that would enable him to take off and land on water. On January 26, 1911, Curtis flew the first seaplane from the water in the United States. Demonstrations of this advanced design were of great interest to the Navy, but more significant as far as the Navy was concerned, was Eugene Ely successfully landing his Curtiss pusher (the same aircraft used to take off from the Birmingham) on a makeshift platform mounted on the rear deck of the battleship USS Pennsylvania. This was the first arrester-cable landing on a ship and the precursor of modern day carrier operations. On January 28, 1911, at an Aero Club show in San Diego CA, Navy Lt Theodore G. “Spuds” Ellyson, a student at the nearby Curtiss School, took off in a Curtiss “grass cutter” to become the first Naval aviator. Curtiss custom-built floats and adapted them onto a Model D so it could take off and land on water to prove the concept. On February 24, 1911, Curtiss made his first amphibian demonstration at North Island by taking off and alighting on both land and water. Back in Hammondsport six months later, in July 1911, Curtiss sold the U.S. Navy their first aircraft, the A-1 Triad. The A-1, which was primarily a seaplane, was equipped with retractable wheels, also making it the first amphibian. Curtiss trained the Navy's first pilots and built their first aircraft. For this he is considered in the USA to be "The Father of Naval Aviation". The A-1 was immediately recognized as so obviously useful, it was purchased by the U.S. Navy, Russia, Japan, Germany and Britain. Curtiss won the Collier Trophy for designing this aircraft. Around this time, Curtiss met the retired English naval officer John Cyril Porte who was looking for a partner to produce an aircraft with him in order to win the Daily Mail prize for the first transatlantic crossing. In 1912 Curtiss produced the two-seat "Flying Fish", a larger craft that became classified as a flying boat because the hull sat in the water; it featured an innovative notch (known as a "step") in the hull that Porte had recommended for breaking clear of the water at takeoff. Curtiss correctly surmised that this configuration was more suited to building a larger long-distance craft that could operate from water, and was also more stable when operating from a choppy surface. In collaboration with Porte, Curtiss designed the "America" in 1914, a larger flying boat with two engines, for the transatlantic crossing. In 1917, the U.S. Navy commissioned Curtiss to design a long-range, four-engined flying boat large enough to hold a crew of five, which became known as the NC-4. The patent dispute with the Wright brothers continued for several years until it was resolved during World War I. Since the last Wright aircraft, the Wright Model L, was a single prototype of a "scouting" aircraft, made in 1916, the U.S. government, desperately short of combat aircraft, pressured both firms to resolve the patent dispute. In 1917, the U.S. government subsequently proffered a large and profitable contract to Curtiss to build aircraft for the U.S. Army. The Wright Aeronautical Corporation, a successor to the original Wright Company, ultimately merged with the Curtiss Aeroplane and Motor Company on 5 July 1929, forming the Curtiss-Wright company, just before Glenn Curtiss' death. Curtiss and his family moved to Florida in the 1920s, where he founded 18 corporations, served on civic commissions, and donated extensive land and water rights. He co-developed the city of Hialeah with James Bright and developed the cities of Opa-locka and Miami Springs where he built a family home, known variously as the Miami Springs Villas House, Dar-Err-Aha, MSTR No. 2. or Glenn Curtiss House. His frequent hunting trips into the Florida everglades led to a final invention, the Adams Motor "Bungalo", a forerunner of the modern RV trailer (named after his business partner and half-brother, G. Carl Adams). Shortly before his death he designed a tailless aircraft with a V-shape wing and tricycle landing gear, that he hoped would could be sold in the price range of a family car. The Glenn Curtiss House, after years of disrepair and frequent attacks by vandals, is being refurbished to serve as a museum in his honour. After traveling to Rochester, New York to contest a law suit brought by former business partner, August Herring, Curtiss suffered an attack of appendicitis in court. He died in 1930 in Buffalo, New York. of complications from an appendectomy. His funeral service was held at St. James Episcopal Church in his home town, Hammondsport, New York with interment in the family plot at Pleasant Valley Cemetery in Hammondsport. Curtiss was inducted into the National Aviation Hall of Fame in 1964, the Motorsports Hall of Fame of America in 1990, the Motorcycle Hall of Fame in 1998, and the National Inventors Hall of Fame in 2003. 1905 Created G.H. Curtiss Manufacturing Company, Inc.
1909 Sale of Curtiss' "Golden Flyer" to the New York Aeronautic Society for $5,000.00 USD, marks the first sale of any aircraft in the U.S., triggers Wright Brothers lawsuits. 1909 First U.S. licensed aircraft manufacturer. 1911 Developed first successful pontoon aircraft in U.S.
1925 Builds his Miami Springs mansion. 1928 Created the Curtiss Aerocar Company in Opa-locka, Florida. "At Dayton". Time (magazine), October 13, 1924. Casey, Louis S. Curtiss: The Hammondsport Era, 1907-1915. New York: Crown Publishers, 1981. ISBN 978-0517545652. Curtiss, Glenn and Augustus Post. The Curtiss Aviation Book. New York: Frederick A. Stokes, 1912.
de Cet, Mirco. The Illustrated Directory of Motorcycles. St. Paul: Minnesota: MotorBooks/MBI Publishing Company, 2002. ISBN 978-0760314173. Dizer, John T. Tom Swift & Company. Jefferson, North Carolina: McFarland Publishing, 1982. ISBN 0-89950-024-2. FitzGerald-Bush, Frank S. A Dream of Araby: Glenn Curtiss and the Founding of Opa-Locka (e-book). Opa-Locka, Florida: South Florida Archaeological Museum, 1976. ASIN: B001L1QU38. Harvey, Steve. It Started with a Steamboat: An American Saga. Bloomington, Indiana: AuthorHouse, 2005. ISBN 978-1420849431. Hatch, Alden. Glenn Curtiss: Pioneer of Aviation. Guilford, Connecticut: The Lyons Press, 2007. ISBN 978-1599211459. House, Kirk W. Hell-Rider to King of the Air. Warrendale, Pennyslvania: SAE International, 2003. ISBN 0-7680-0802-6. Mitchell, Charles R. and Kirk W. House. 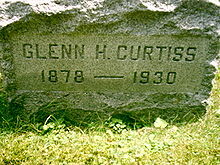 Glenn H. Curtiss: Aviation Pioneer. Charleston, South Carolina: Arcadia Publishing, 2001. ISBN 978-0-7385-0519-0. Roseberry, C.R. Glenn Curtiss: Pioneer of Flight. Garden City, New York: Doubleday & Company, 1972. ISBN 0-81560-264-2. Shulman, Seth. Unlocking the Sky: Glenn Hammond Curtiss and the Race to Invent the Airplane. New York: Harper Collins, 2002. ISBN 0-06-019633-5. "Speed Limit." Time (magazine), October 29, 1923. Trimble, William F. Hero of the Air: Glenn Curtiss and the Birth of Naval Aviation. Annapolis, Maryland: Naval Institute Press, 2010. ISBN 978-1591148791.